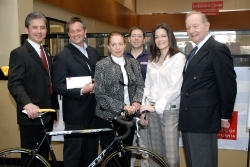 A check for $25,000 from the Union Bank of California Foundation was presented to the President of Velo Club LaGrange and the family of Scott Bleifer to establish a scholarship program in honor of the well-known cyclist and former Union Bank employee who was killed last September while training for a bike race on Pacific Coast Highway in Malibu. Bleifer had been training for the Arthritis Foundation's Amgen California Coast Classic, an eight-day, 500-mile charity ride from San Francisco to Los Angeles that was just 14 days after he was struck by a catering truck. The collision also killed another avid cyclist Stanislav Ionov, 46, of Calabasas. More than 400 local riders gathered for a 40 mile ride last October to honor the memories of these two fallen riders. "We are pleased to have the opportunity to provide scholarships to deserving students. Scott had a tremendous passion for his work and for cycling and this is something that the Union Bank of California Foundation can do to keep Scott's wonderful spirit alive," said John Stephan, a senior vice president with Union Bank. said LaGrange board member Dan Weinberg. "Union Bank has done a truly wonderful thing by supporting future generations of cyclists. In the face of this tragedy, all kinds of people are pulling together to change dangerous road conditions that put cyclists and drivers in harm's way." Bleifer, 41, was a resident of Santa Monica and an active member of the Velo Club LaGrange. He had worked as a vice president at Union Bank since l992, handling real estate transactions in the special assets division. He was a graduate of Beverly Hills High School and received his undergraduate degree from University of California at San Diego and a master's degree in real estate development from USC. Based in San Francisco, UnionBanCal Corporation (NYSE:UB) is a bank holding company with assets of $49.4 billion at December 31, 2005. Its primary subsidiary, Union Bank of California, N.A., had 315 banking offices in California, three in Washington, and one in Oregon at December 31, 2005. The company's Web site is located at www.uboc.com.